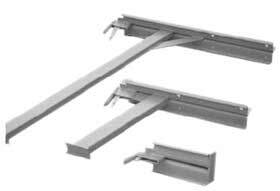 2 Board and 3 Board Brackets, The two and three board stage brackets enables an additional 255 mm, 450 mm and 675 mm platform respectively to be provided on the inside of the Scaffold nearest the building. Board Stage Bracket enables an additional 255 mm platform to be provided on the inside of the scaffold. They do not require Tie Bars to connect them together. Available with rolled " T " Section or back to back welded angles.